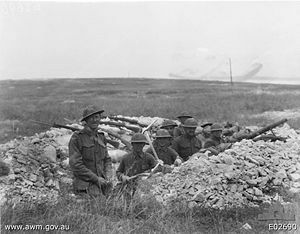 The Battle of Hamel (4 July 1918) was a successful attack launched by the Australian Corps of the Australian Imperial Force and several American units against German positions in and around the town of Hamel in northern France during World War I. The battle was planned and commanded by Lieutenant General John Monash (later knighted). Many of the tactics used were illustrative of the departure from the largely unsuccessful tactics of earlier years and the development of modern military tactics such as the use of combined arms. The battle was a success, with all objectives being achieved in 93 minutes, over the planned battle time of 90 minutes. In previous battles, using conventional tactics, the fighting could have lasted for weeks or months with much higher casualty rates. For example, a similar defensive position had resisted capture for two months in the Battle of the Somme. The battle was notable because it was the first time in the war that American troops participated in an offensive action, and it was the first time that American troops served under non-American command. Four American companies in total participated with Australian troops under Australian command. There were 1062 Australian casualties (including 800 dead), as well as 176 American casualties (almost 100 dead), while there were probably 2000 Germans killed and 1,600 captured, along with much enemy equipment. Charles Bean, the official Australian war historian, noted that Monash was more effective the higher he rose within the Army, where he had greater capacity to use his skill for meticulous planning and organisation, and to innovate in the area of technology and tactics. Bean had been no great admirer of Monash in his early career, in part due to a general prejudice against Monash's Prussian-Jewish background, but more particularly because Monash did not fit Bean's concept of the quintessential Australian character that Bean was in the process of mythologising in his monumental work 'Australia in the War of 1914-1918'. (Both Bean and Monash, however, having seen the very worst excesses of British military doctrines and the waste of life on the Western Front, were determined that the role of the commander was to look after, and protect as far as possible, the troops under their command.) Bean, who had said of Monash "We do not want Australia represented by men mainly because of their ability, natural and inborn in Jews, to push themselves", conspired with Keith Murdoch to undermine Monash, and have him removed from the command of the Australian Corps. They misled Prime Minister Billy Hughes into believing that senior officers were opposed to Monash. Hughes arrived at the front before the Battle of Hamel prepared to replace Monash, but after consulting with senior officers, and after seeing the superb power of planning and execution displayed by Monash, he changed his mind.